1. Check the item's status. 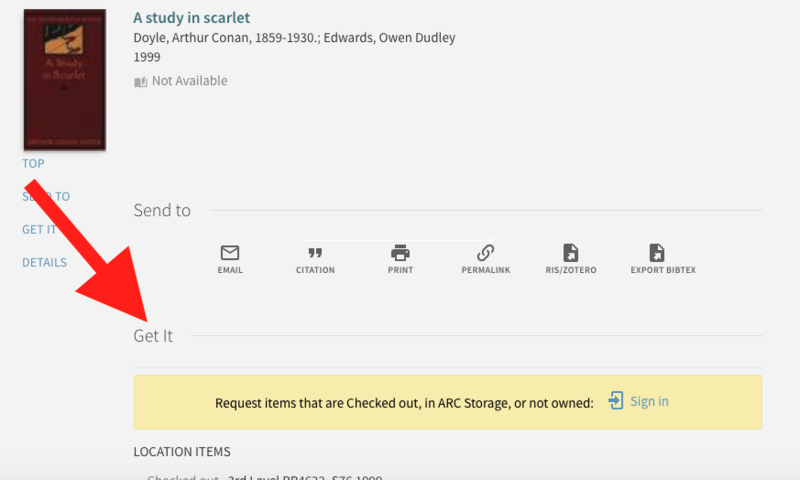 If an item is either not available (checked out) or in ARC Storage, it is necessary to place a request in order to retrieve it. 2. Access the item's detailed record. Click the item's title in Esearch to access its detailed record. Look for the "Get It" heading. Follow the sign-in link, using your NetID and password to access the system. Choose the "request" option. You should receive a confirmation message indicating that your request was successful. If the item was in ARC storage, you can pick it up at the Circulation Desk in around 10 minutes. If the item was unavailable, you will receive an e-mail once it becomes available.